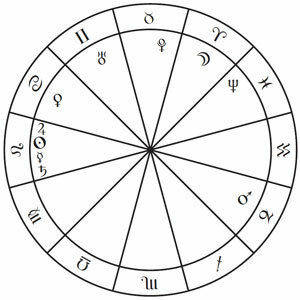 A stellium is defined as a group of several planets in a single sign of the zodiac or a single house. In the example to the right the native has a stellium of four planets in Leo, consisting of Jupiter, the Sun, Mercury and Saturn. This cluster of planets leads to an emphasis on that particular sign in the chart. It is possible for there to be more than one stellium in a chart. Technically the plural of stellium is “stellia”, although astrologers have a tendency to say “stelliums” in practice. Some older texts use the term satellitium instead of stellium, although the concept appears to be the same. Contemporary authorities are somewhat divided over the minimum number of planets required to form a stellium. 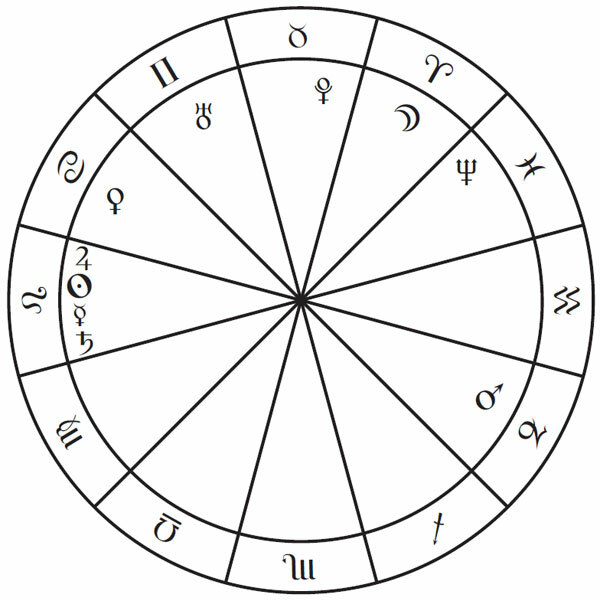 In some sources a stellium is defined as four or more planets in a single sign/house, but in other sources it is defined as three or more planets in a sign/house. For example, Alan Oken says that a stellium “should involve no less than four planets” (Oken, pg. 435), whereas Julia and Derek Parker define stellium as “a group of planets — three or more — in one sign or house…” (Parker, pg. 57). Other sources prefer to remain more ambiguous about the exact number of planets involved. For example, Celeste Teal simply defines it as “a grouping of several planets in one sign or house” (Teal, pg. 267). Stelliums are thought to denote a heightened level of focus on the sign or house that they fall in in a birth chart. This leads to the qualities associated with the sign or the topics associated with the house being much more prominent in the native’s life, often to the extent that they become dominant factors in the chart as a whole. Oken, Alan. Alan Oken’s Complete Astrology. Bantam Books, New York, NY. 1980 (rev. ed. 1988). Parker, Julia and Derek. Parker’s Astrology. Dorling Kindersley, New York, NY. 1991. Teal, Celeste. Predicting Events With Astrology. Llewellyn Publications, St. Paul, MN. 1999.